Nearly a week after Thailand's election, the first since the coup of 2014, it remains unclear which party could form a government. 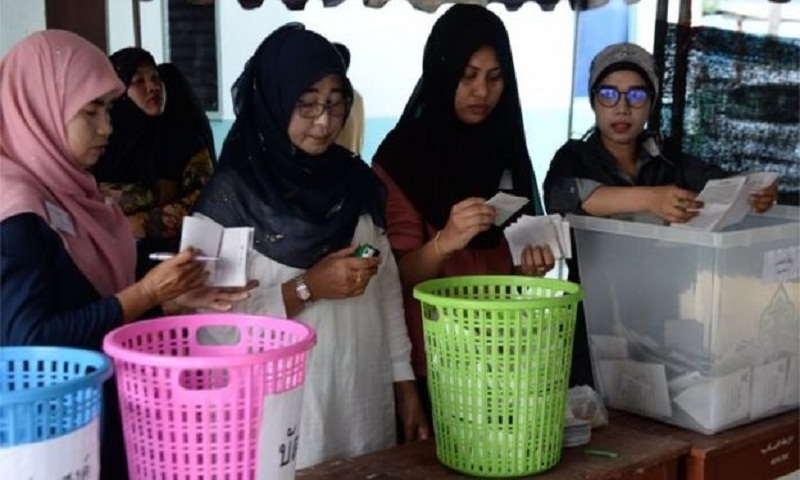 On Thursday, the Election Commission (EC) released the unofficial results, showing the pro-military party had won the popular vote. However, the count has been marred by concerns over voting irregularities and official results are due by 9 May. Sunday's election had been billed as a return to democracy for Thailand. But the military was criticised for taking steps to ensure it would remain influential in politics, including appointing all 250 seats in the upper house. A complicated system of allocating seats in parliaments based on vote share, introduced by the military, means it remains unclear how many seats each party will ultimately have. The BBC's South East Asia correspondent Jonathan Head explains the complexities around what just happened in Thailand. Why is it taking so long to get answers? In previous Thai elections, the results came through more quickly and clearly. This time the EC had problems tabulating results from the 350 constituencies. On Sunday there were some crazy figures from a few. The voter turnout announced also seemed far too low at 65%. The EC abruptly stopped publishing numbers after the vote, failed to clarify the next day, blamed the media when its own data was suspect, and had some inconsistent statistics even when giving a final vote count on Thursday. Palang Pracha Rath, the party allied with the ruling junta, has 8.4 million votes Pheu Thai party, the opposition party allied with exiled former prime minister Thaksin Shinawatra, won 7.9 million votes. It isn't clear why the EC, with a very large budget and plenty of time, had these problems. It briefly mentioned hacking attacks on its servers on Sunday. But the inconsistencies - now raising the turnout to nearly 75% - have raised concern that the count is being manipulated, with a petition calling for the commission to be dismissed getting more than 800,000 signatures. The only international group able to monitor the election has been highly critical of the EC's poor performance. Who looks most likely to form a government? The new government will not be formed until the results are certified by 9 May, giving time for the EC to investigate alleged violations of election laws, and even to re-run the election in some areas, if needed. A vote in both houses of parliament for the next prime minister is expected within a few weeks after that. The betting has always been that Prime Minister Prayuth Chan-ocha would keep his job, because the military-drafted constitution allows the 250-seat senate - appointed by the junta - to vote for a prime minister. But the unofficial results show a possible majority of seats in the lower house for a seven-party opposition coalition, led by the pro-Thaksin Pheu Thai. Whereas the pro-military Palang Pracha Rath is some way short of a majority. That means even if Gen Prayuth wins the vote for PM, his government could be paralysed in parliament. There is furious behind-the-scenes bargaining for support from the non-committed parties, like Bhum Jai Thai, with its valuable block of 50+ seats. ANFREL, the international monitoring group, has stopped short of labelling this election "not free and fair". But it is highly critical of the advantages given to the incumbent military government, of poor voter information and restrictions on freedom of expression. Many Thais suspect there was some rigging of the election, but no real evidence of this has been produced. Despite many reported irregularities, experienced election watchers here believe the published results probably reflect the broad preferences of Thai voters. The Election Commission has lost a lot of credibility, and will be watched closely in the coming weeks, to see how fairly it deals with complaints, and how it allocates the 150 proportional party list seats. It has not said what method it will use, and different methods make a critical difference, one giving the opposition a majority, the other leaving it two seats short. Will Thais accept the results? Many younger Thais have expressed bitter disappointment over the strong performance of Palang Pracha Rath. In the rural north-east, die-hard Pheu Thai/Thaksin supporters have been dismayed by their own party's much weaker performance. Much now depends on the next six weeks. As things stand the anti-military coalition believes it commands a majority in the lower house, and while it cannot outvote Gen Prayuth for the prime minister's job, it can stop him governing. Its supporters believe the election has given them a mandate at least to stop the military from continuing to rule the country, and to force a different compromise. If the EC makes significant changes to the current seat estimates, either through the way it calculates the party list seats or through disqualifications for infractions of electoral regulations, expect some public outcry. Likewise, if the pro-military side persuades MPs to defect from the other side, to block a possible opposition majority, there could also be public anger. But few people believe there will be a repeat of the street protests and violence of previous years. Thais are, by and large, disillusioned by what those protests produced. There are new political forces now, which will look for different ways to express their dissent. A greater risk is the possibility of another military coup, if there is stalemate in parliament. The current army commander has hinted that the military would not support a government linked to Thaksin Shinawatra.